I promised you part 2 yesterday but I am just getting around to it now! Sorry! Tuesdays are my busiest days! We made THE BEST 3 courses in food & wine last night and I was in a food coma when I came home and had to just relax in bed. So the adventure continues…! The next stop on our trip was Krakow, Poland. Let me just tell you I have never tried a perogie before and I’m not sure if it really matters because everyone said they aren’t even half as good in the USA but I will probably still go to the grocery store and buy them frozen as soon as I get back! I’m obsessed! The first night we got there was Tuesday and we had a pub crawl scheduled. So we quickly got changed and ready and went out to grab dinner before leaving for the night! The people at the hostel were really nice and recommended a traditional polish place. It was TINY, only 5 or 6 tables, and had all different kinds of perogies. We got 3 plates of the traditional (potato and cottage cheese) called “ruskie” and were served more than enough perogies. They also had sour cream to dip them in so you really can’t have a bad meal when sour cream is involved! We had so much extra that we brought some home for later that night (it was a late-night snack!). The next morning we woke up for our freezing cold tour! Our tour guide was really into his job and made it more bearable because of his enthusiasm. The city of Krakow didn’t have much to see (dare I say that?) and we spent most of our time up at the castle. There are many myths involving dragons and magic with the castle which were interesting. The tour ended in the city square that was beautiful! Probably my favorite city square based on just looks. We shopped at a little market afterwards, but like I said it was freezing so we stopped for lunch at a cute spot. All we wanted were perogies but THE PLACE WAS ALL OUT! Apparently they had a big group dinner the night before and hadn’t had time to make more. Devastating. We almost left but were too cold and hungry so Ashley and Erin got this traditional soup in bread bowls and me and Hannah split Kielbasa. So good! I already knew it was one of my favorites but Hannah had never tried it and fell in love (much like me and perogies!) so it was a good experience for her! Luckily the kielbasa tastes just about the same in America just maybe not cooked with as much love as the natives. Aushwitz I reminded me of the Phillips Exeter campus. Weird? It is just a bunch of brick buildings that look like dorms, and they’re now transformed into museums. Each room has these huge displays of things left behind. For example, there is a room of baby shoes, suitcases, hair, glasses etc. And it was piles on piles on piles of everything. I got really choked up at everything but especially the suitcases because they had names and addresses on them and we were told that the Nazi’s would tell the prisoners that they were going to go home after the camp and they would send their stuff back for them, but they would be sent to the gas chambers. We went in one of the gas chambers and I almost threw up. I’m going to stop here because it’s hard to think/write about. From there we went to Prague and I’m glad because it really cheered everyone up! Prague IS AMAZING! Definitely my favorite place in the world! The only down side is that people smoke more than they breathe. The first night we went to a bar and you couldn’t even see clearly because of all the smoke and now, a week later, my clothes still reek after being washed! We stayed because it was the only close place serving food past midnight and we hadn’t eaten dinner!! In the morning we did the normal tour, saw so much beautiful architecture and then we dipped on the tour once we got to the market (which we found out was the best decision because it went on for 3 more hours and was boring!) The Old Town Square is what sold me on Prague. There are tons of vendors selling everything and they have amazing street food. I realized that is the one thing I don’t like about Florence – no street food! Yes, pizza, pasta, gelato are amazing but I want a sausage or fried dough on the go sometimes! I got cute trinkets/souvenirs and we loved the square so much we went back the next day! They had the same desserts as in Budapest but smaller and filled with Nutella..YES PLEASE! 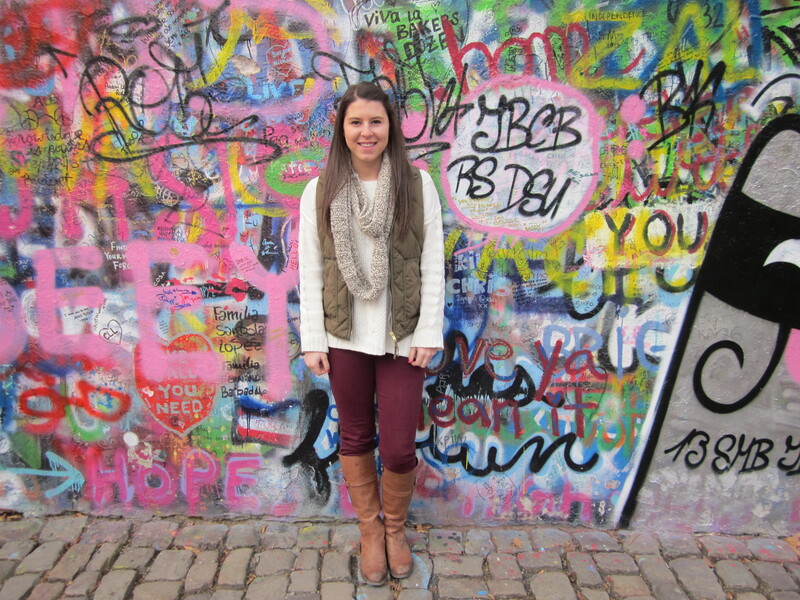 Prague is also home to the John Lennon wall, the Charles Bridge and the Prague Castle. All beautiful! The John Lennon wall was a sight to see and it is really cool how basically every week it looks completely different because people are constantly spray painting new things. If you don’t know the history it is just a wall dedicated to Lennon/The Beatles and people just write Beatles quotes all over it. I really wanted to write my parent’s wedding song “Here, There and Everywhere” on the wall but we went to a couple stores around and none of them sold sharpies/markers! Annoying! But at least now they know I wanted to – love you mom & dad! The bus ride home was 12 hours on Easter Sunday but there was nothing I could do about it. We watched a lot of movies and I read a whole book! (The new Emily Giffin). I got home that night and got to see my roommates for the first time in 11 days and we talked all about our trips! We had Monday off for observation of the national holiday Easter Monday (beats me) and I got to relax and adjust to being home! Albums of spring break to come soon!! This entry was posted in Travel and tagged charles bridge, czech republic, kielbasa, krakow, lennon wall, perogies, poland, prague, pub crawl, the beatles. Bookmark the permalink.